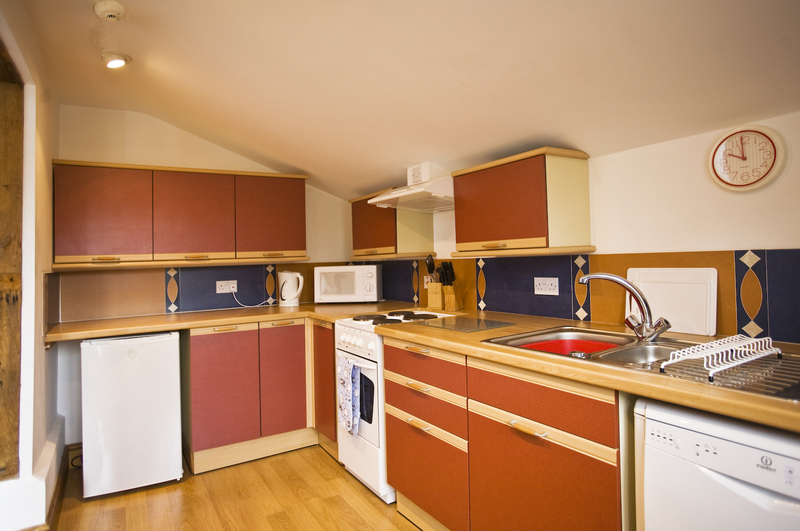 Little Dodges is flexible two or three bedroom ground floor accommodation depending on the size of your party and budget. Families come in all shapes and sizes and we hope to accommodate all our guests ensuring that their holiday will be tailor-made in every way. 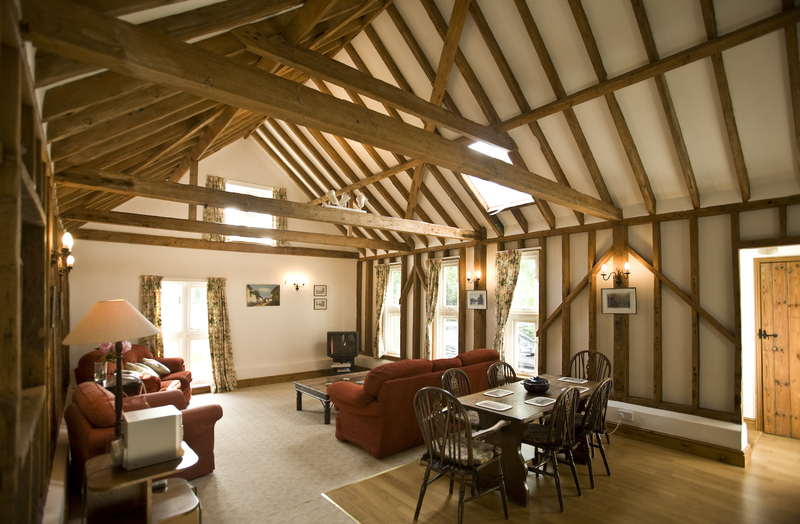 Spacious with heaps of character, our living accommodation has a vaulted ceiling and skylights with original honey coloured pine beams throughout. The Living area has two comfortable sofas and an easy chair in which to relax after a long day sightseeing! A polished wood coffee table and further side table are appropriately spaced for the leisure of the occupants. This cavernous area is lit by wall lights and for avid book readers a further standard lamp will shed yet more light. Rest and relaxation is complete with a Television, DVD and Video player. The long North facing windows allow views of Joanna and Paul’s garden as well as the surrounding panoramic countryside in the Weald of Kent. 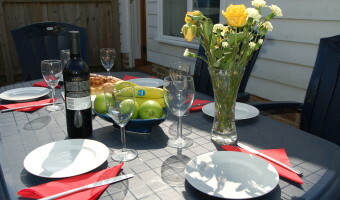 The Dining area of the cottage has a dark wood polished table and matching seating for six persons. The floor is recently tiled which allows ambient warmth from the under floor heating. Relax with music from a Sony radio/cassette/CD player which serves both the Sitting and Dining areas. Children and grown ups alike will be entertained with a bookcase stocked with videos and various DVD’s and books. We have a sideboard which is home to place mats, table cloths etc. We also supply a large assortment of brochures showing information on places of interest, opening times and cost. If you don’t find what you want, then please come and ask Joanna and Paul who will be delighted to help in any way possible. Please contact Little Dodges. Free wireless Internet access We offer broadband and Wi-Fi. However, speed and service is variable and can vary, especially as we are in a rural area where it may not operate at speeds to which you are accustomed. This is fully equipped and all you need for a self- catering holiday. 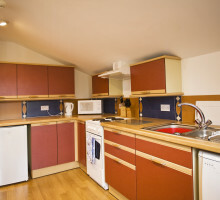 A dishwasher, larder fridge with ice compartment, microwave and electric cooker with ceramic hob incorporating a grill. Better still treat yourselves and dine out locally! This is a separate area housing a washing machine and tumble drier. Little Dodges has a bath with a handy mixer shower over the taps (just perfect for washing the children’s hair! )and an anti slip mat is available. There is a separate shower cubicle with a clear folding door, basin & w.c. A useful pine mirrored cabinet is available for storage of items and includes a hairdryer. The floor is tiled and we have ample towel rails. 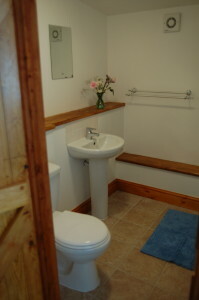 The ensuite shower room contains a wc, basin and shower cubicle which is fully tiled. There is wooden shelving and towel rail. The floor is tiled so the underfloor heating can be enjoyed fully. 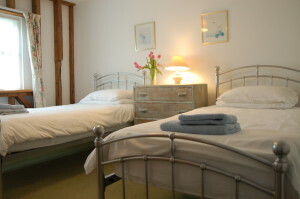 This pleasant beamed room has a choice of either 2 single beds or 1 super-king. So you can choose! A small wooden table separates the two beds with a table lamp. There is also a fitted wardrobe with plenty of hanging space and a three drawer pine chest with triple mirrors for that panoramic view. More beams and comfortable beds! A large chest of four drawers for storage as well as a large fitted wardrobe home to a vacuum cleaner, ironing board, iron and broom. You can hang clothes in there too! Floral cottage-type curtains adorn the window. Outside there is off road parking for a number of vehicles. 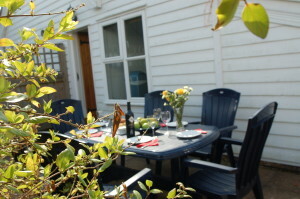 At the rear is a secure courtyard area containing a table and comfortable seating for six people. A fragrant honeysuckle and jasmine clamber riotously up the fence. For the outdoor chefs there is a wheeled charcoal barbecue. 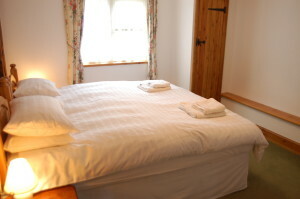 The cottage sleeps either 4 people in comfort (2 beds) or 6 (3 beds + cot). A cot/highchair – available on request at the time of booking at no extra charge. Bed linen for the cot is NOT supplied. 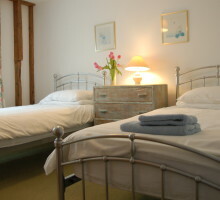 Full bed linen and duvets are supplied free of charge. Heating – This is cosy oil-fire under floor at a further cost during the winter season. Electricity – A charge is now made for this when more than 50 units in any one week are used. The cost is 50p per unit above those allowed.